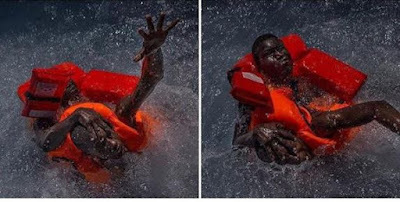 Scottish photographer Mathieu Willcocks captioned these photos of two migrants from West Africa drowning in the Mediterranean being rescued by Migrant Offshore Aid Station (MOAS). The migrants were among those rescued this week while attempting to cross the sea on a overcrowded rubber boat. Both were struggling in the water, one pushing the other under. Their rubber boat had started to sink and many migrants ended up in the water. Fortunately, the MOAS rescue team was there in time to distribute life jackets and assist the migrants. These two guys panicked and struggled in the water for a very short moment before being pulled to the safety of a large flotation device nearby.